I have been a wee bit absent this past week for a very good reason. Are you ready to hear? Yeah! Alright, as a little background: From the moment I conceived of writing the engagement months for Mr. Darcy and Elizabeth Bennet, I imagined covering the time thoroughly. To do so it seemed very possible I could write two books rather than one. In fact, that was my plan up until a couple of months ago. For various reasons I altered my plan to include the events in one book. 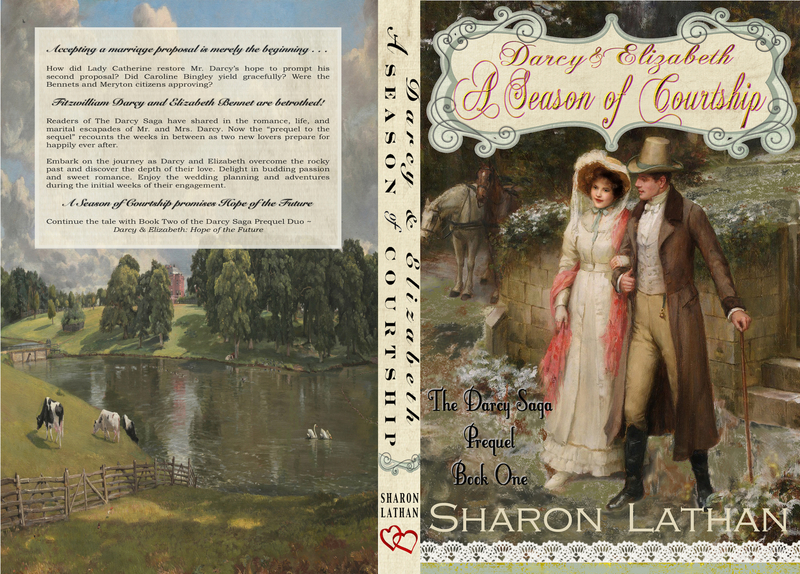 I titled it Darcy & Elizabeth: A Season of Courtship and created the cover accordingly. Then, the more I wrote I kept dreaming up additional ideas I wanted to include and, well, long story short, I realized I had a dilemma. If I wrote everything I wanted, it would not only take longer to complete — thus delaying the release — but would probably be too big of a book to publish for a decent price. To make it reasonable I knew I would need to cut portions or forego writing certain parts. The other option was to go back to my original plan. That being to split the “prequel to the sequel” into two volumes. By doing so I can release the first half by March, as I wanted, and then complete the rest for a June to July release. Each volume will be a normal sized novel — that being approximately 95,000-100,000 words, or roughly 260-300 pages each. Altogether that is more Darcy and Lizzy, just spaced over time! At this moment I am confident the eBook will be available by mid-March, if not sooner. Hopefully the print version will be ready at the same time, or very shortly thereafter. The publishing process for print takes a bit longer, so I will post updates on that. Part of the print preparation was creating the backcover and spine, which I did this week and reveal now. *All images can be clicked for larger view. Book One, A Season of Courtship, begins at the proposal and extends roughly one month, leaving the brides-to-be in London on a shopping expedition. Lots of fun happenings, I promise! Book Two continues exactly where Book One leaves off, with the couples exploring London and their relationships. The final month of the engagement period will be recounted, including the wedding ceremony and reception/breakfast afterward. Seeking a title from the final chapters of Pride and Prejudice, as I did with A Season of Courtship, I chose a phrase within the same sentence! 36 Comments for Prequel News! Sharon, I’ve loved reading all of your Darcy Saga books, including the 2 newest! When will the next book in the series after “The Trouble With Mr. Darcy” come out? I CAN’T WAIT! I’ve read the whole series several times now…Please hurry!!! What happened to the second book?? Yes, we sure are anxious for Hope of the Future!!!! Any updates??!! Can’t wait to read Hope of the Future! What is it’s release date? What beautiful covers for both books, Sharon. I’m glad that you decided to stick to your original plan and publish two books instead of one heavy tome. I love all of your books. I am really looking forward to reading the two prequels. Your stories are beautiful. Somewhere on the internet you mentioned once that you might write a story about Darcy’s parents. I would be very interested in reading that. Looking forward to reading more info on how you create the covers. They are lovely. Wow, two books!!!!! I am so excited and looking forward to adding these to my Pride and Prejudice collection. I am truly fascinated by the cover art and that you designed it-so cool! I wish you all the best with the last minute touches. Thanks Emily. I appreciate the good-luck wishes. So far everything is going well, but I am anticipating a few hiccups. LOL! So exciting, I think you did the right thing. I cant wait! The covers are womderful. I am so glad you decided to write another book rather than toss out your other ideas. I can’t wait to read them both. Can’t wait for the release! This is great news!!! What an exciting prospect! I’m really looking forward to reading about William and Lizzie’s courtship and can’t wait to get my hands on your next book! LOVE the covers!!! Can’t wait to read them and add them to my JAFF collection. Good luck getting your book done on time!! Excited about you new books!!! Can’t wait til release date! I am a print girl and CANNOT wait for both books!!! No pressure BUT hurry!!! You have certainly got us in a state of anticipation!!!!!! I do wonder however why Lizzy is not as diminutive on the cover as the other books! Her head fits under his chin in those books. Also you show Darcy with a cane and in one of the books he doesn’t like the cane. Just wondering!!! Just kidding 🙂 I will have the print ready soon too. The formatted Word doc is ready to go. Just waiting for the final edits, then can upload. The only reason print takes a bit longer is the time to order the physical book so I can ensure it is okay. With eBook I can see it immediately, fix any errors, then instantly upload the new file. Press “publish” and BOOM! the book is on sale. Print takes more time to process. As for the details you mentioned, first: Great catches! I think you have read my books too many times. LOL! Seriously, it is a matter of finding the right painting. There are many out there, but finding one that fits everything is next to impossible. For A Season of Courtship, I loved this pic but had to tweak it a bit. I think I’ll add a post on “before and after” 🙂 I could have removed the walking stick, and did consider that, but then the man’s arm would be sticking out to his side for no reason. I did manipulated the woman’s face and darken her hair to be more Lizzy-like, but could not make her smaller without having the whole image look strange. That is the brief version. I really will write a post on how I went about designing the covers. Pretty fun and interesting, I think. Sharon, thank you so much for taking us on the Darcy’s journey beyond the movie. I own and love all of your books and can’t wait for these two books releases. I hope that you will have a signing so that I can get them sign too. And I love the covers too. I’m dancing too, Seli! I am glad folks are pleased with the 2 book decision. I went round and round on the idea, but in the end knew I would be disappointed if I rushed the process and missed anything. Do you design them yourself? Hi Deborah. Thanks for the cover comment! I did indeed design and create these two covers. Now that I am independently publishing, I am tackling all the work myself. I am kind of a techno nerd, so love this kind of stuff. So excited to know there are two new books coming!! Love the covers too. Thank you for the update. I can’t wait to read both books. I have all of your other books and love each one. The covers are beautiful also.